I had a few requests for a tutorial for this treatment. Here goes. Also, a text summary after the jump. Projectile Motion Strobe Effect from Dan Meyer on Vimeo. 1. Record video from a stationary source. Like a Flip cam on a tripod, for instance. 2. Trim the video to one shot. 3. 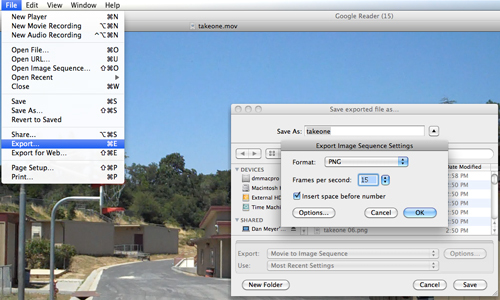 Export that clip to an image sequence. 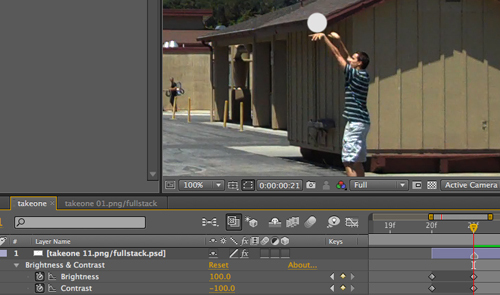 15 frames per second gets you pretty clean motion. 4. 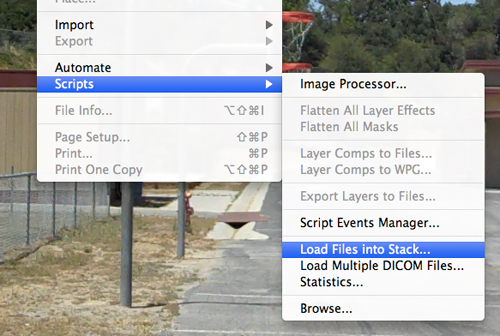 Load those images into a stack in Photoshop. 6. 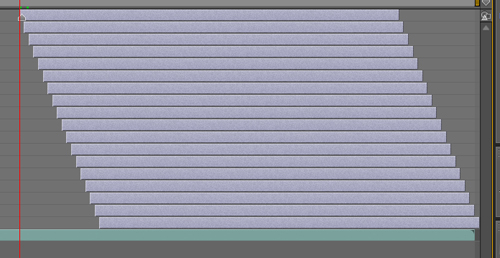 Import all these resources into Adobe AfterEffects. 7. Extend the masked basketball layers to the end of the composition. Otherwise they won’t hover in mid-air. They’ll just disappear after two frames. 8. Keyframe the brightness of each basketball layer to give yourself one frame of pure white at the start of each layer. 2013 Mar 18. Chris McCaffrey offers a less expensive method for creating the images (if not the video also). This is definitely the way I would do it, but I can’t help but comment on the expense of this solution. If you or your employer have access to this software, and actually know how to use it, awesome; I’m wondering what the lowest-tech way of achieving this effect: Simultaneously viewing an object’s location at different times. Most modern video editing programs have an export frame feature. In the worst case, you could use printscreen. 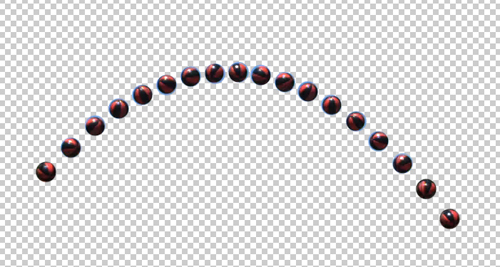 GIMP is free, and offers layer functionality, without which this effect is nigh impossible. Thanks for sharing the step by step process of creating the video. Now more of us can create similar videos and share them with everyone in the blogosphere!!! An xenon-tube strobe light. Ramsay sells a kit $20, and a 10-year-old can assemble it (with supervision). These approaches require low ambient light, so are limited to indoor and nighttime shots. Extracting stills from video is more versatile, but requires a bit more sophistication. I think I would use the burst function on my camera or use a 1-2 second exposure. The darker background would be nice. A gym maybe. Thanks for the info. Need the software and a work computer that can actually run the software. One way simple way I did this was have someone take many pictures from one spot with a high speed camera. Seven for serving a volleyball (as high speed as I have access to anyway) Then I took each picture and copied the strip with the ball and pasted the strip with the ball in word document. Shift-apple-4 is a pretty nice tool in Apple. Then I had students upload the image into Geogerba and model the path with a function. This was before we even talked about the quadratic or anything related to it. Had some pretty good stuff from kids. I approached this image like an art project I did in grade school when I cut strips out of a magazine. Word of caution though instruct your camera person to NOT follow the ball! You will see in my image that the camera person followed the ball at the end and therefore I could not line the last one up. The video is nice and all, but I’m curious: how many takes were required to actually sink the shot? I only missed shots I meant to miss. For the sake of student learning, of course. appears nowhere friction model for launch. one more thing to consider when filming with one camera is the central geometry in capturing the shot. should also consider the turn his hand transmit to the ball, the ring size could ultimately rejected the model of friction for a short or necessary to launch a very strong and etc. This is super helpful, Dan. Thanks for sharing! We’ll be using this to analyze projectile motion with and without (significant) air resistance. Looking forward to sharing our work with the community. In your video, at 2:28, you load the images into Photoshop. The window with the images is sitting open right in your view… shouldn’t you be able to just grab those images instead of having to navigate to them? You can! Just drag one of those images onto the “Open” dialog box, and the dialog will navigate directly to that image’s file location. I’d been meaning to try this for awhile. February break gave me the chance to sit down and get it done. I realize I cut a few corners on the geogebra file, I figure I’ll be reworking it a bit when I get around to using it in a lesson. [PS] Swedish Yoghurt	[WCYDWT] Will It Hit The Hoop?